It’s Kip’s Trivia Night, and all types are descending on Berkeley’s most timeless dive bar for an evening of midweek frivolity. 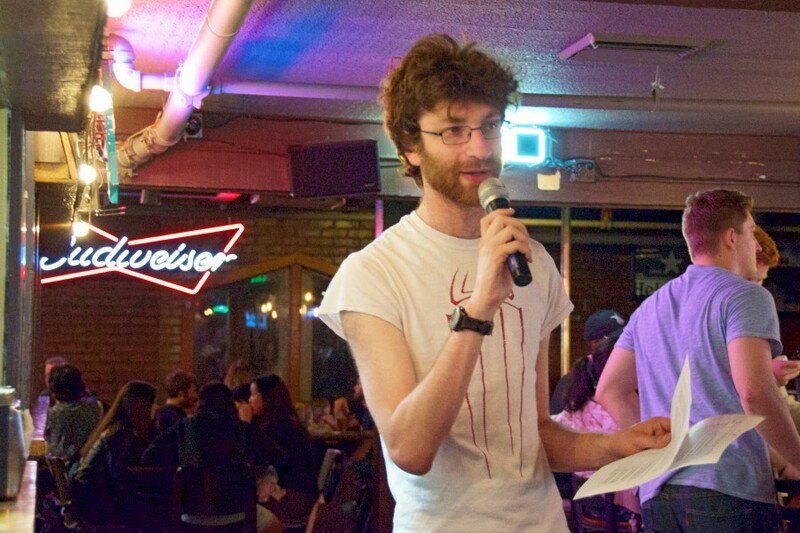 Students and locals, among them a team from the Trader Joe’s in Rockridge and a group of UC Berkeley EECS graduate students, come to trivia with one goal in mind: winning the grand prize of a single pitcher of beer and above all, bragging rights. All that stands between them and glory is a series of random facts — on Greek gods, on Spongebob, on anything, really. The master of those facts is Jacob Rubin, the 26-year-old Oakland native who runs the show every single Tuesday. The trash-talking is rampant as the crowd gives its evening over to the trivia gods — or, in this case, Rubin, who stands at a table between some nondescript speakers to ask the first question. “What song did Beyonce drop on Feb. 6?” he reads over the microphone. Collective groans and gasps of excitement ensue. The game begins. Rubin looks like the kind of guy who would run a trivia night. A worn T-shirt and open flannel hang off his 6-foot-5-inch frame, and thin-framed square glasses sit on his nose, just a few inches below an explosion of curly brown hair. He’s a self-proclaimed nerd, and he has the chops to back this up — his day job is manning the storefront of Escapist Comic Bookstore and he fills the rest of his time with stand-up and sketch comedy and a radio show in which he interviews comedians about their music preferences. But all of this fades on Tuesdays as he simply becomes “the dude who runs trivia night at Kips.” He paces the bar as the game gets going, preparing to extoll tater tots and free shot glasses to teams who win bonus rounds. He keeps rowdy customers in check and repeats his questions once, twice, sometimes three times to his drunken disciples. He keeps rowdy customers in check and repeats his questions once, twice, sometimes three times to his drunken disciples. But as the questions get more difficult, the demeanor of the room is quick to change. After Rubin lobs out a question on the namesake of New Zealand, teams lean in, whispering. Others look around as if waiting for divine intervention. Between rounds, there’s a lull. Phones come out and teams Google answers others while others buy beers and wait for the results. Rubin tallies the scores. Rubin has been writing and conducting trivia since 2012, which means years of spending at least five hours a week on his computer, skimming Youtube and Googling rapidly, and also commanding a large computer file with every question he’s ever asked or might ask. He does this all for a price — albeit a small one — but it’s also because he flourishes in the bizarre world of trivia. Rubin will arrange his vacations so he can be at the bar come 10 p.m. Tuesday. He’s taken the helm while sick, grabbing a hot toddy at the bar and powering through the night. When he has to miss, he gets substitutes. A labor of love, but it’s paying off — trivia night is bigger than ever. Better, yes, but still elusive for most who choose to compete. By the end of the night, many teams have suffered tough losses. The facts simply didn’t add up. They had no clue what Radiohead and TLC song share the same name; their UC Berkeley education seems less substantial than they originally thought. Still, Reuveni and countless others will show up next Tuesday without fail, hopeful that this time the facts will bend to their will and that the golden pitcher of cheap beer will land in their brilliant hands. This eternal optimism is the joy of Kip’s Trivia Night, and also its curse. Libby Rainey is both the former editor of the Weekender and a current opinion columnist. Email her at [email protected], and read her column “Bits of Berkeley” with Alastair Boone every Thursday.